I was not convinced having General Conference and Easter on the same weekend was a super idea...until today. Our day was perfect. We watched Conference and felt the spirit in abundance as the Apostles and Prophet testified about the meaning of Easter, of the gospel. To have those messages borne by the spirit on Easter was very special. I was impressed by several talks and noticed how often the family, family roles, and parenting issues were treated. I absolutely loved Elder Holland's talk yesterday afternoon. Elder Cook's talk nearly blew my socks off. He said, "While we rejoice in the supernal significance of Gethsemane and Calvary, our focus has always been in the resurrected Lord." So, so true. Elder Perry's talk to the mothers especially touched my heart. I am very grateful for an uplifting spiritual feast. In light of my experiences earlier this week with the Passover, Easter took on a new meaning. After conference Justin hid our Easter loot around the "side yard." I pysched up Amelia into putting on her Easter Dress to look for eggs with her basket. She was very enthusiastic. 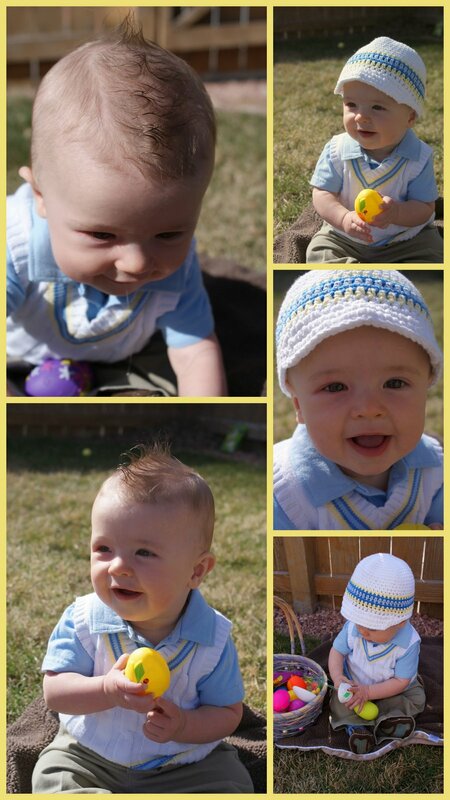 I dressed up Phillip too just because he looks so cute in his Easter duds. 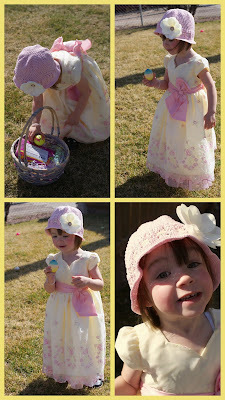 Once outside Amelia could not stop talking about all the eggs, treats, presents, etc hidden in the grass. She talked Grandma and Grandpa Call's ears off then did the same to Grandma Debbie. I was nearly in laughing tears listening to her dialogue. Justin and I felt so happy to have two wonderful kiddos, especially such an entertaining daughter. Phillip loves to sit now. He screams when laid on his back. This year I only made the kids a coordinating hat *gasp*. It was worth the time! Justin spent a good portion of the afternoon tending two pork chops he smoked in our new smoker. He prepared everything down to the meat thawing, dry rubbing the meat, and tending to the thermometer. My contribution included baked potatoes and grilled asparagus. We went on a little walk after dinner to settle our meal. I appreciated Amelia and Justin's help cleaning bathrooms and putting away our weekly mound of laundry. Grandma Debbie, Jeremy and Jared are driving to our home from Utah tomorrow. Amelia is very, very excited, ME TOO! *She found a photo from our wedding day. She said, "Mom! Look! It's your wedding...you gotta pay for it!" Believe me kid, we are paying for it. *One day she came into the kitchen coddling a baby sponge wrapped in a soaking wet towel, crooning lullabies to it.